It’s your day of leisure. You decide to treat yourself to some serious pampering, starting with a blissful manicure. You turn on the television, sink into a comfy chair and start with your nails. After a while you have a look at your artwork – oops! One of your nails look as it has been a meal to a rodent, and another one is shaped (or unshaped) to resemble something between a square and a round. 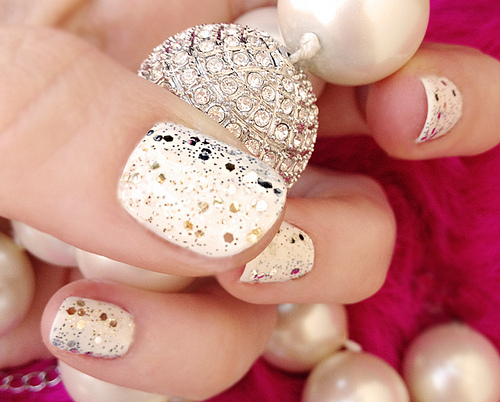 Dirty, unkempt and shapeless nails will often spoil your entire look, even if you are dressed in your hottest couture. But don’t panic! You don’t have to wait for the nail to grow and gain back its shape and lost glory, as you can go in for the various nail quick fixes available. Check it out…. Nail Extensions: If your manicure has cut the length of your nails short, it’s nail extension to your rescue. In this process, artificial but real-looking nails are chosen according to the width of your own nail. They are glued onto your natural nail, and then cut to the length of your choice. Then the skilled professional will file the nails into perfection and apply a color or gloss of your choice on them. And the best bet is that – it’s the easiest, and the cheapest way to get long and glamorous nails in a jiffy! Acrylic nail extension can give you sturdy and healthy looking nails. An acrylic solution is applied at the base of your nail, on the area where the artificial one is bonded with your natural one. Once the artificial nail is bonded, a gel with thick viscosity is applied all over the nail. This gel is usually set under UV light. Silk wrap method provides long lasting results. A thin lightweight linen is applied to the base of the bonded nail. Apart from silk, wraps in linen or fiberglass are also common. You can go in for ‘refills’ once your nail grows, to conceal the gap between the base of the nail and the extension. This will help you maintain your extended nails longer while giving it a natural look. You could also go in for ‘buff and polish’, where the nails are buffed back to shape and polished to give back its finish. Nail Art: Flaunt nails of different lengths and colors! Sport artificial nails with wild and creative designs! It’s a rage, since it offers a variety of multidimensional and multicolored designs. Mood for an extra sparkle? Then opt for stick-on diamantes and crystals. Give it a protective layer of clear topcoat. What better way to hide your flawed nail? Nail Tattoo: A tattoo on your nails is fun and trendy! It will also take off the attention from your shapeless blunder. They are temporary, and of the stick-on variety to be applied over your nail. When giving yourself a manicure at home remember: Always file your nails only in one direction. Use a non-acetone nail polish remover: Make sure you don’t peel your skin and cuticle off in the wrong direction. Use a clean manicure set: Apply a clear nail polish as a top coat or sealer. This will minimize chipping or cracking of the nail. Always make sure that you go to a skilled nail expert to give you that perfect manicure. You could also go in to nail spas and indulge in different treatments available exclusively for your fingers. PS Your blog looks awesome! Reblogged this on Ashley John Beauty Blog.